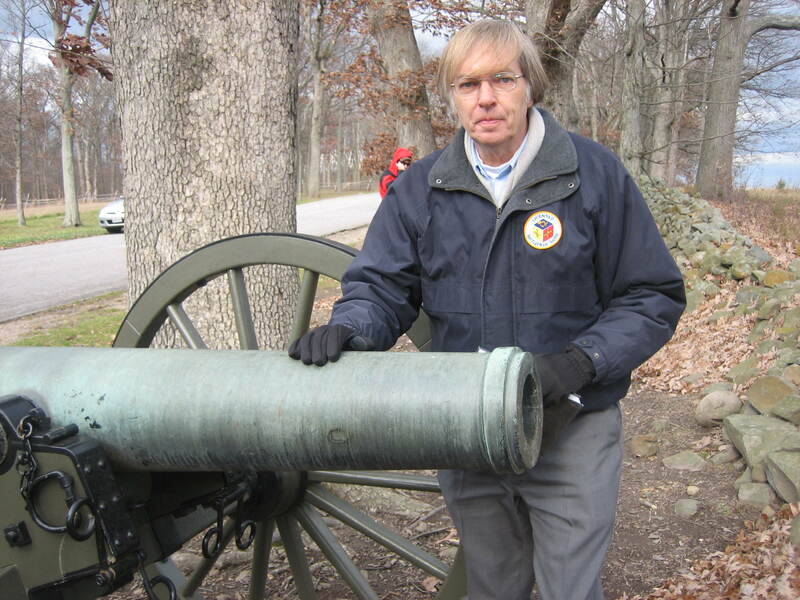 Licensed Battlefield Guide George Newton showed us some Gettysburg National Military Park artillery pieces last Sunday. 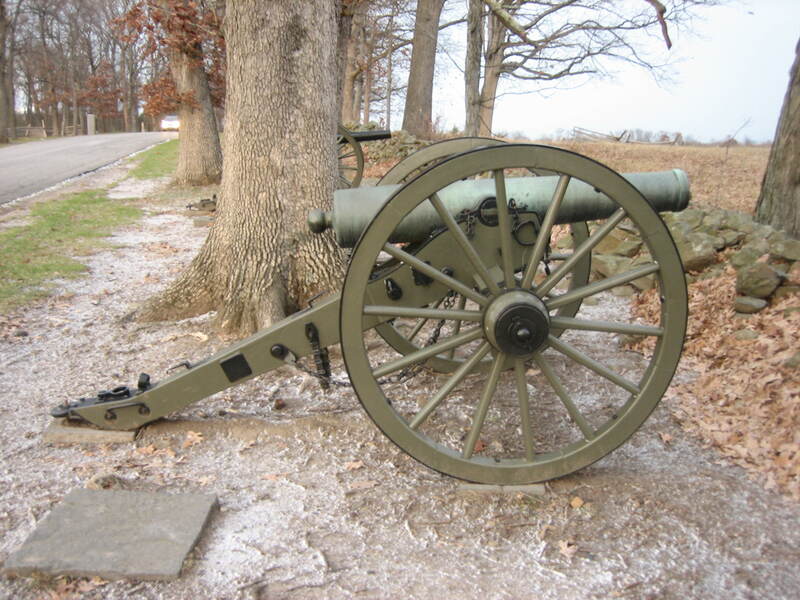 He started with this Napoleon on Seminary Ridge near the North Carolina Monument, which was manufactured by Quimby and Robinson in Memphis, Tennessee. This view was taken facing northeast at approximately 2:00 PM on Sunday, November 17, 2008. 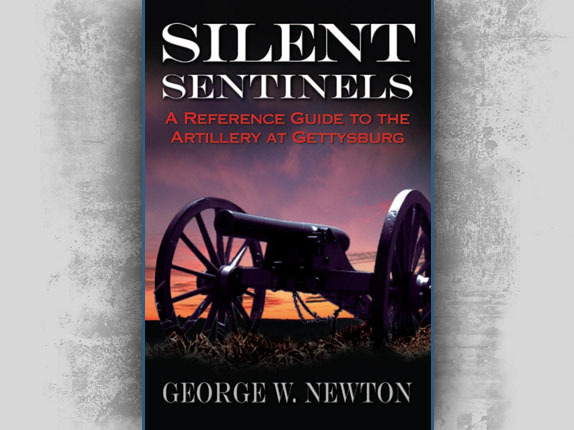 Licensed Battlefield Guide George Newton is a native of Baltimore, an Air Force Vietnam War Veteran, a retired insurance executive, and the author of Silent Sentinels: A Reference Guide to the Artillery at Gettysburg. 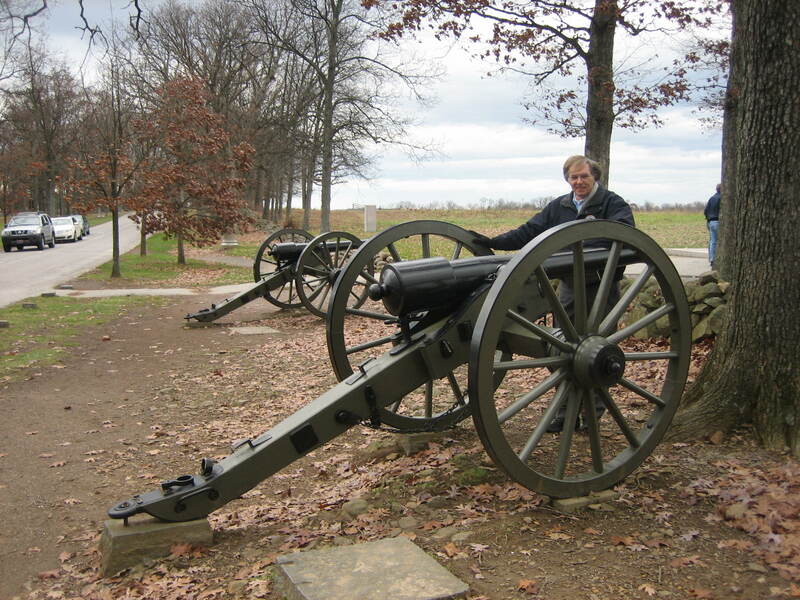 On a very windy Sunday, he took us on a tour of some artillery pieces at Gettysburg National Military Park. 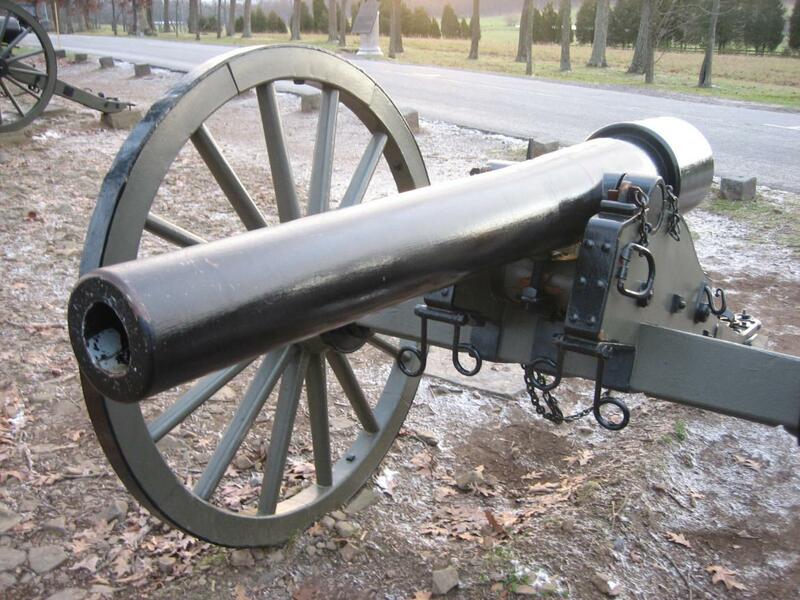 We will feature two of those pieces located near the North Carolina monument today: A Napoleon manufactured by Quimby and Robinson in Memphis, Tennessee, and a 10-pounder Parrott Rifle, manufactured by the West Point Foundry in Cold Spring, New York. We apologize for the videos’ sound quality on this windy day. 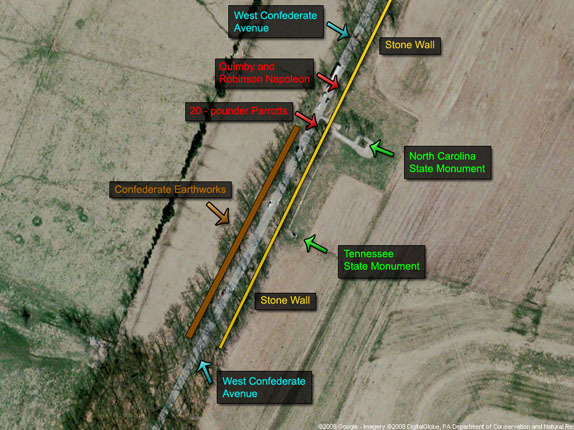 See our post on the Confederate Earthworks on Seminary Ridge on October 30, 2008. 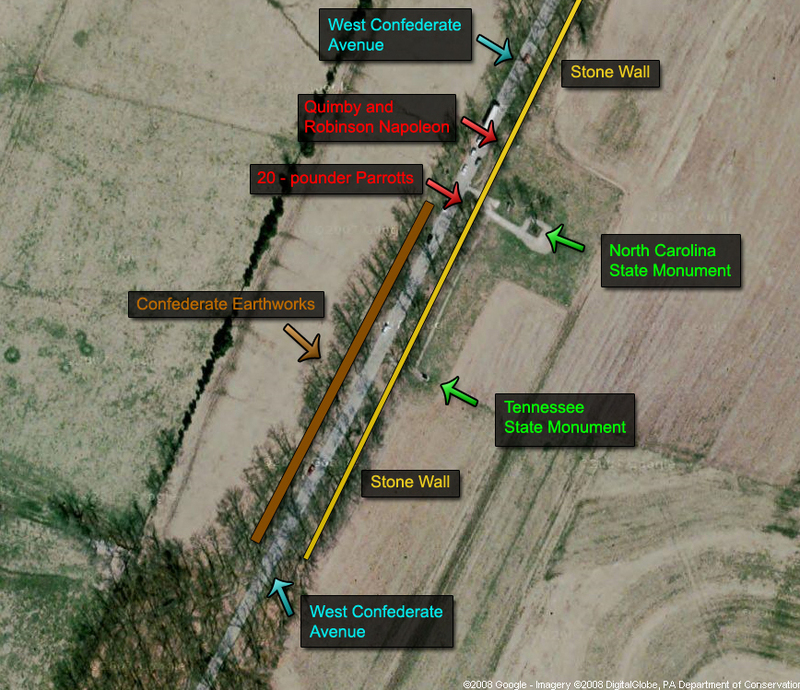 This map shows the locations of the guns featured by George Newton east of West Confederate Avenue near the North Carolina Monument. They mark locations occupied by Lane’s Battalion, Anderson’s Division, Hill’s Corps. The Quimby and Robinson Napoleon is at the location marked by Ross’ Battery. 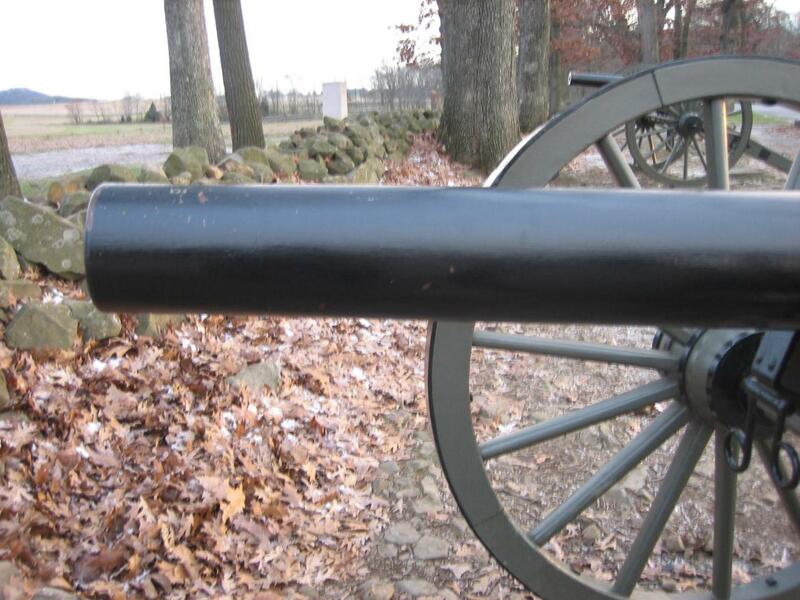 The 20 Pounder Parrotts are at the location of Wingfield’s Battery. This map was created facing north at approximately 8:00 PM on Friday, November 21, 2008. 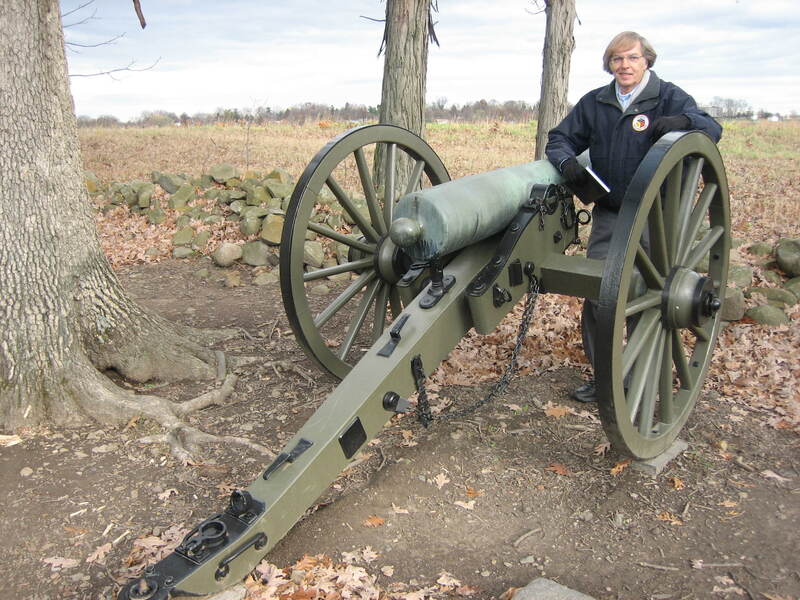 This video has George introducing himself, on a windy Sunday afternoon, and explaining that Gettysburg National Military Park owns 436 artillery tubes. 367 of those tubes are displayed on the battlefield when they are not being refurbished in the cannon shop. This view was taken facing northeast at approximately 2:00 PM on Sunday, November 16, 2008. 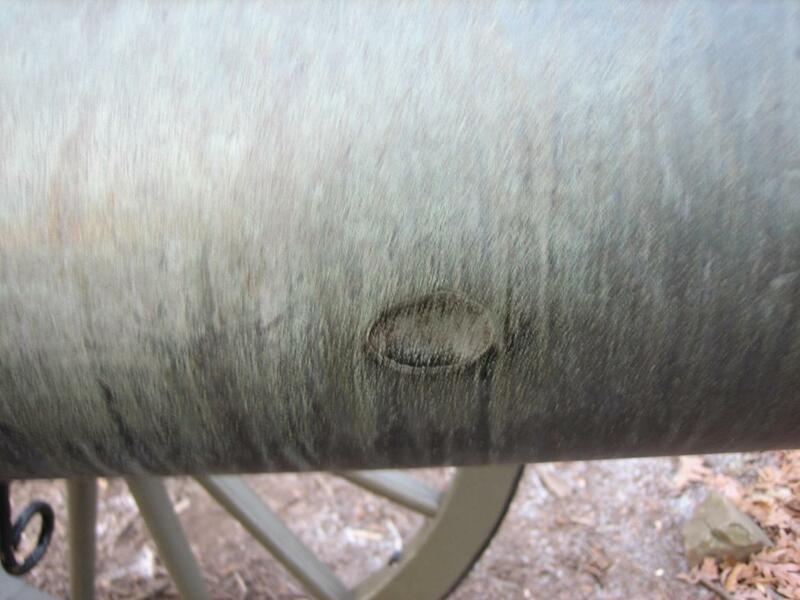 The first tube that George shows is Napoleon manufactured by Quimby and Robinson Foundry located east of West Confederate Avenue near the North Carolina Monument. This view was taken facing north at approximately 4:30 PM on Friday, November 21, 2008. This video has Licensed Battlefield Guide George Newton introducing the Quimby and Robinson Napoleon. Quimby and Robinson manufactured 48 artillery tubes during the Civil War, before Memphis was captured by the United States Army in June, 1862. Eight of those tubes were Napoleons, and only two of the Napoleons are known to exist today. Both Quimby and Robinson Napoleons are owned by Gettysburg National Military Park. One is in storage, and the other is the tube which George is describing for us. This view was taken facing north at approximately 2:00 PM on Sunday, November 17, 2008. The Quimby and Robinson is also interesting for the dent in the tube below George’s right hand. This view was taken facing north at approximately 2:00 PM on Sunday, November 16, 2008. George explained to us that the dent may or may not have been made from battle damage. 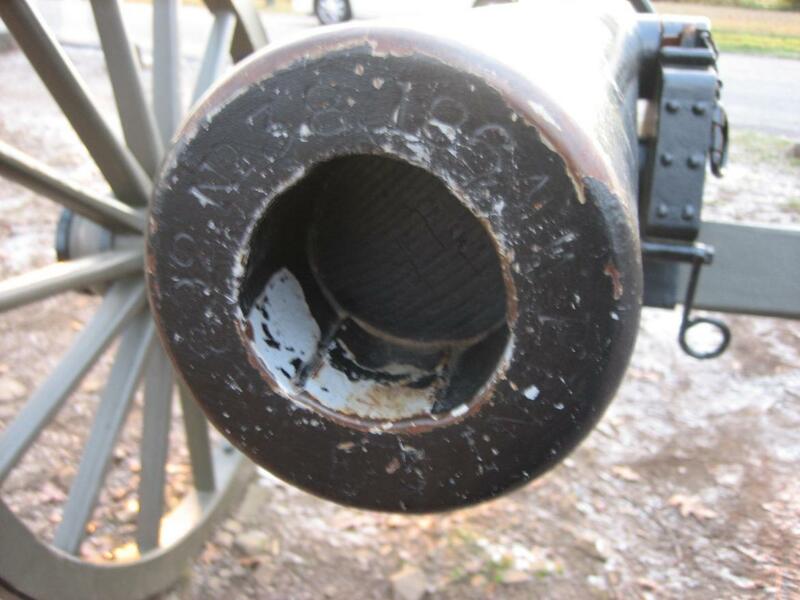 More likely is that the damage came when the tubes were stored in various arsenals after the Civil War. They were not delicately handled. In the late 1800s, the United States government had labeled these cannon, “condemned guns,” which as George said, “is government-speak for junk.” This view was taken facing north at approximately 4:30 PM on Friday, November 21, 2008. This video has George Newton explaining the weight, effective range, and maximum range of the Napoleons. This view was taken facing northeast at approximately 2:00 PM on Sunday, November 16, 2008. We then moved south to Wingfield’s Battery to the two 10-pounder Parrotts. This view was taken facing northeast at approximately 2:00 PM on Sunday, November 17, 2008. Robert Parker Parrott, a West Point graduate, and Superintendent of the West Point Foundry, invented the Parrott Rifle in 1860. During the Civil War, the West Point Foundry employed 1400 people, and produced approximately 2000 cannon and over three million artillery shells. This view was taken facing southwest at approximately 4:30 PM on Friday, November 21, 2008. This video has George informing us that although the Parrotts were accurate, they had a reputation for not being very reliable, including bursting on occasion. This view was taken facing northeast at approximately 2:00 PM on Sunday, November 16, 2008. This video has George explaining more about the areas where the Parrotts would burst, and how Parrotts were the cheapest to produce of the three main types of artillery pieces (the Napoleon, the 3-inch Ordnance Rifle, and the Parrotts. This view was taken facing northeast at approximately 2:00 PM on Sunday, November 16, 2008. This video has George explaining the best ways to tell authentic cannon tubes from reproduction tubes. He also explained how Calvin Gilbert had a contract with the War Department between 1895-1919, to replicate some of the cannon tubes. This view was taken facing north at approximately 2:00 PM on Sunday, November 16, 2008. To tell if a Parrott is authentic, look first to see if the muzzle has a slight swell. This view was taken facing southeast at approximately 4:30 PM on Friday, November 21, 2008. If it doesn’t have a slight swell, look at the muzzle to see if there is writing. No writing means the muzzle is a reproduction. This view was taken facing southwest at approximately 4:30 PM on Friday, November 21, 2008. 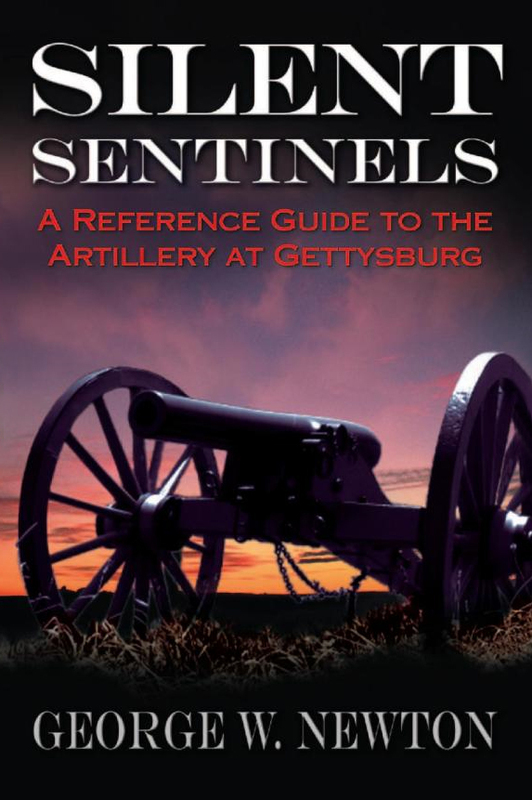 George’s Book, Silent Sentinels: A Reference Guide to the Artillery at Gettysburg, was published in 2005 by Savas Beatie LLC, 521 Fifth Avenue, Suite 3400, New York, New York, 10175. The telephone number is (610)-853-9131. The book is 259 pages with 235 pages of text, photographs, and illustrations. It is currently retailing on Amazon.com for $29.95. The cover of this book was scanned at approximately 8:30 PM on Friday, November 21, 2008.